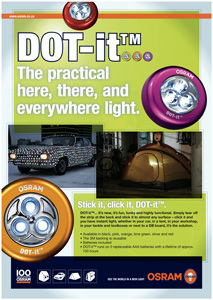 We congratulate Sharyn McCormick and the Marketing team at OSRAM South Africa on winning the silver prize in the OSRAM International Promotional Pool 2007 for the retail launch of the DOT-it™ product in June 2006. Gold prize went to OSRAM Turkey for their Student Illumination Movement campaign, with bronze going to OSRAM USA for the Global Care Launch: Earth Day. 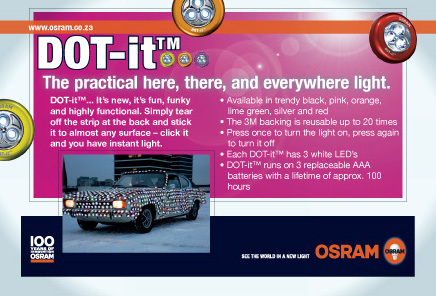 OPS assisted OSRAM in creating point of sale items for in-store promotions, as well as additional items ranging from postcards and flyers to magazine adverts and truck artwork. One Part Scissors is proud to have been involved! 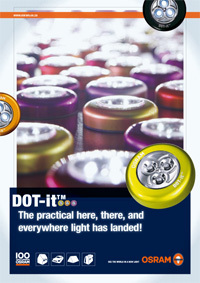 DOT-it™ press kit front cover - this is an information pack which was distributed to the members of the press.